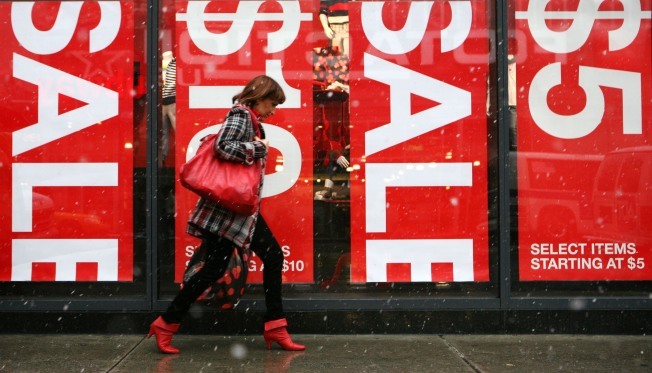 A shopper passes "sale" signs as she walks past a store window during a snowstorm on Friday in New York. Retailers are accelerating their use of survival tactics -- slashing prices further and pulling merchandise off shelves to send to liquidators -- as the number of holiday shopping days dwindles. CHICAGO — Swirling snow, packed parking lots and massive markdowns greeted many shoppers across the country this weekend as retailers tried to woo consumers to open their wallets during the final holiday countdown. From flagship department stores to main street shops, consumers found extended hours — in some places, around-the-clock shopping — and even some extra-cheery customer service as merchants hope to salvage one of the worst shopping seasons in decades, brought on by the recession and growing economic uncertainty. At the flagship Macy's store on 34th Street in New York, shoppers swarmed racks offering 65 percent off women's clothing. Elsewhere, the store was offering 50 percent off handbags by designers such as Dooney & Bourke and Coach and 40 percent off gold earrings. Thirty-eight-year old Chris Moscardelli found deep discounts even when he snagged a cashmere blanket for more than half off. "It's been a great day," he said. Raleigh, N.C., resident Kim Rardon was surprised by the price cuts she saw while searching for gifts on Saturday at Crabtree Valley Mall in north Raleigh. "They're really trying to get you in there," she said. In Miami, Ana Solis bought T-shirts from the Disney Store featuring Kermit the Frog and Tigger. One shirt — original price $24.99 — was marked down to $7.99 before another 40 percent discount. But business was anything but brisk for Ahmad Parpia, the store manager at Marquise Jewelers inside Dallas' Valley View Mall, who's seen his most profitable period of the year fizzle out. Few shoppers are coming inside his four stores to buy diamond-encrusted chains, gold watches and jewelry, despite signs advertising: "Financing available up to $10,000. Will beat any competitive price." "It's almost like 80 percent down over the last two years," he said. "I've never seen before a Christmas like that, and I've been in this business almost 15 years." The International Council of Shopping Centers expects established stores to post their worst performance for the holidays since at least 1969, when its index began. It predicts same-store sales, or sales at stores open at least a year, will fall as much as 1 percent for the November and December period and fears the decline could even be steeper. Still, shoppers were out at Kmart and Sears stores this weekend as customers stocked up on last-minute gifts and electronics like Nintendo's Wii, Blu-ray players, digital cameras and tools. In some cases, shoppers lined up before stores opened for weekend doorbuster deals. "For the most part, we beat our previous week, which was a great kind of benchmark, because last week was strong for us," said Tom Aiello, a spokesman for the stores owned by Sears Holdings Corp. But store traffic was slower in some parts of the Midwest and New England where storms dumped snow and ice, he said. More than a dozen Macy's Inc. stores were spending the weekend in the midst of a retail marathon, pledging to stay open around the clock until Christmas Eve. At Woodfield Mall in Schaumburg, Ill., shoppers were making purchases at 4 a.m., and officials expected the overnight shopping crowd to grow each night as Christmas Eve nears. "It was active," said Mike Dervos, executive vice president of Macy's upper midwest division, who added that shoppers are buying many of the same items they've sought in previous years, like cosmetics and fragrances. "We were pleased." Still, some people inside America's malls seemed more like scouts than actual customers, waiting for last-minute bargains or browsing stores but holding few, if any, bags. After electronic gadgets, practical gifts seemed to be among the most popular. At Regency Square in Richmond, Va., items like sweaters, jeans, hats and scarves were some of the most common items being bought. And at Fairlane Town Center in Dearborn, Mich., near the headquarters of Ford Motor Co. — which has been hurt by the drop in auto sales — shoppers were eschewing jewelry and fur and leather items for unisex apparel, boots and outwear, according to mall owner Taubman Centers Inc.
Philadelphia resident Amy Warner managed to cross off her shopping list items like DVDs, wine, jewelry and gift cards, including a grocery store gift card for her grandparents who live near Allentown, Pa.
"My grandmother said, 'All we really want is a gift card from Wegmans,'" Warner said. "They're retired. They have a fixed income. I don't think there's anything they really needed other than this."